The journey of 1000 miles begins with a single step – or in this case a single stroke of the pedals. I first envisioned this trip over four years ago, when I discovered the Sun Magazine held an annual writer‘s retreat at Esalen in Big Sur. 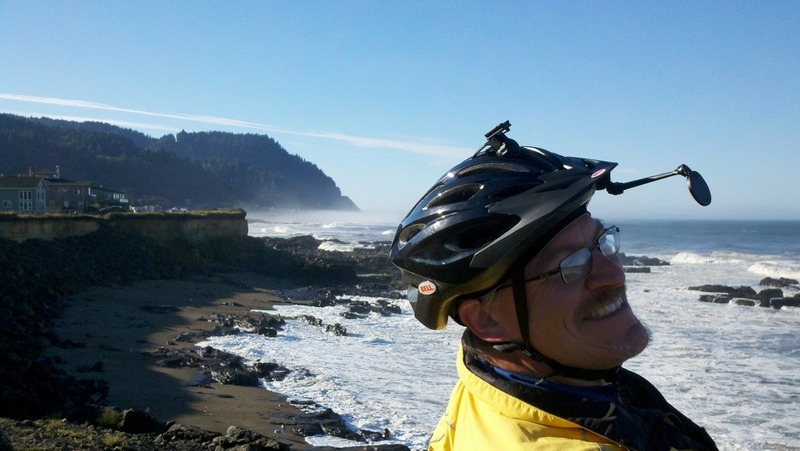 The plan: ride from our home on the Marys Peak Watershed in Philomath, Oregon to Big Sur, California. To round out the trip to an even 1000 miles, how about catching the Amtrak home in Santa Barbara. I realize those who know me must be wondering how I could be in shape for such an undertaking. I am a veteran cyclist. I had toured the Big Sur coastline by bicycle while in grad school. My last tour had been a tandem trip with Intaba to San Francisco in 2000. But nine years of running a restaurant had added a dramatic expanse to my waistline. A remarkable turn of events helped me prepare. Seizing the opportunity presented by an 3-week bout of severe bronchitus in June, I made an abrupt course change in my lifestyle. I stopped neglecting my health, and began eating more wisely. As I overcame the illness, I felt so much better that my legs were literally itching to ride again. In July I began riding my bicycle every day. I hadn‘t ridden for years, but found it surprisingly easy to start with 15 mile rides for the first week, then 20 mile rides the second week, then 25 and so on, until was riding 50 milers eight weeks later. I know this is no small feat! And yet I found that the muscles I had built 10 and 25 years ago were still there, waiting to ride.